Dianne Feinstein is the oldest sitting senator in America. She entered Congress in 1992 (when I was 4 years old). 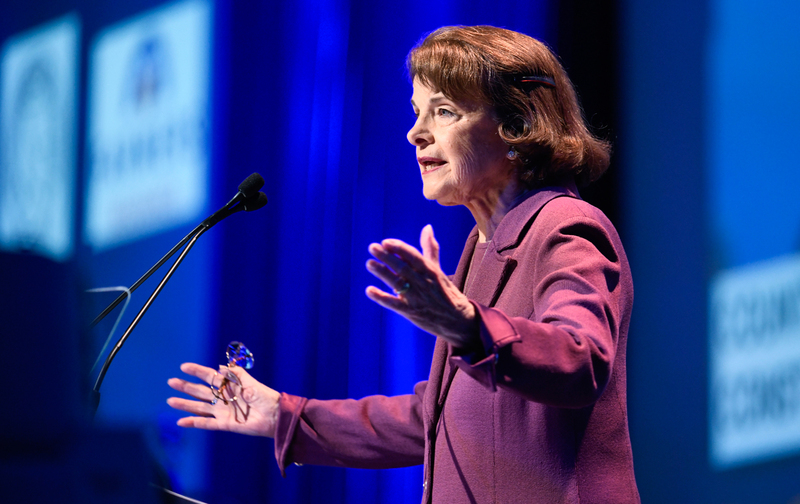 Today, at age 84, she is running for a fifth term in office, and a lot of people in the Golden State are unhappy about it—enough to deny Feinstein the state Democratic Party endorsement at this past Saturday’s convention. The question many have asked as Feinstein runs once again has been—“Is an 84 year-old politician too old to run for office?” But that question oversimplifies the matter. As with all aging politicians, it’s not Feinstein’s numerical age per se that is the problem. Rather, it’s her political distance from a Democratic base that is becoming younger and more progressive. Millennials and Gen Xers—who outvoted Baby Boomers in 2016 and will likely do so again this November—are a demographic that Democrats must turn out in high numbers. And the inconvenient reality for Feinstein is that her politics are not shared by this rising electorate. Her record of service, while impressively storied, contains highlights such as voting for the 1994 crime bill, voting for the Iraq War, giving the NSA carte blanche to spy on citizens, and recently writing a bill that would have required local authorities to comply with ICE. Feinstein has made the case that her experience should be considered a powerful asset. But, with good reason, younger voters are skeptical of that argument. In American politics, decades of service in public office is often confused for a kind of civic meritocracy. Henry Kissinger, who should be considered a war criminal, still gets invited to black-tie dinners and Ivy League campuses. Hillary Clinton, a politician with dodgy judgment, was hailed as “the most qualified presidential candidate ever.” By this logic, someone like Feinstein should have been a shoo-in for the party’s endorsement. But today’s young voters are looking for more than just experience for the sake of itself. These voters hold progressives views in high regard, but also consistency and integrity when it comes to those views—leaders whose politics, party affiliation, and actions are closely interlinked and non-contradictory. Bernie Sanders, who is only eight years younger than Feinstein, had no trouble winning over millennials, because his entire career has been a crusade for the kind of economic populism that many young people dream of now. What happened to Feinstein last Saturday is what happens when politicians fail to perform regular self-assessment checks of how useful they are to up-and-coming generations, and how well they speak to youth priorities like economic justice, criminal-justice reform, and protecting immigrants from the Trump administration. Back in the 1990s, Feinstein could afford to ignore her lefty critics without jeopardizing her electoral odds. But tuning out those activists for decades blinded her to how her party’s base had evolved. Feinstein isn’t alone in her newfound vulnerability. The rise of young voters will also pose a big problem for Joe Biden’s 2020 presidential campaign, should he chose to launch one. As soon as young people take a closer look at his startlingly anti-progressive record—which includes co-authoring the 1994 crime bill and supporting several bills that made it tougher for Americans to reduce their student debt—not to mention his condescending comments about millennials—Biden, age 75, will be exposed as another elder statesmen clinging to power, an old guard so enamored with his service that he failed to see the angry youthful crowds materializing at the gates. The humiliation of Dianne Feinstein is a warning for today’s senior political leaders. The youth are coming. The gates are still closed. That leaves two choices. Open the gates and have dialogue with the underrepresented. Or watch as they break in and breeze right by you. Miles HowardMiles Howard is a communications consultant and the author of The Early Voters: Millennials, In Their Own Words, On the Eve of a New America.